With Halloween just around the corner, it’s likely you’ll be planning which fancy dress outfit you’re going to wear to both impress and scare your friends – and if you’re not, get planning. Whether it be a complicated makeup job to transform you into a terrifying clown or, if you’re anything like me and don’t do ‘scary’, you’ll probably be googling the best mermaid or alien transformations. Whichever route you decide to go down, it’s unlikely to cause as much controversy as an Oscar Pistorius costume which is being sold in one fancy dress shop based in Luton. Yep, that’s right. The costume encourages people to dress up as the double amputee Paralympian who shot and killed his girlfriend Reeva Steenkamp back in 2013. The costume, which is on sale at Jokers’ Masquerade in Luton for £22.99, includes a athletic-style green and yellow running vest and shorts, which mimics the outfit Pistorius wore at the 2012 Paralympics when he represented South Africa and came second in the 200m race. Also included in the costume are black and silver boot covers and white knee covers, to give the impression that the person wearing the costume is an amputee. 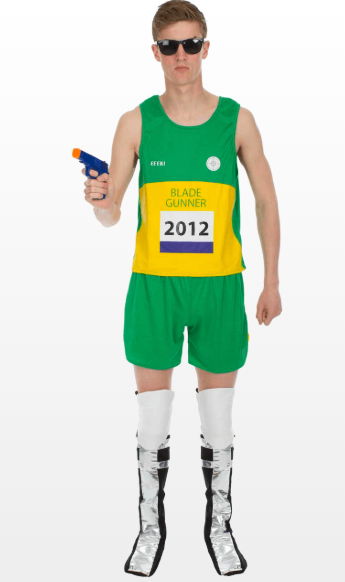 The costume has the words ‘Blade Gunner’ printed on the front, making reference to Pistorius’s nickname ‘Blade Runner’. To further the controversy, the model is also holding a water pistol which makes reference to the 2013 murder of Pistorius’ girlfriend, South African model Reeva Steenkamp. In the early hours of the morning on Valentine’s Day, Pistorius shot Steenkamp four times in his home in Pretoria, resulting in her death. 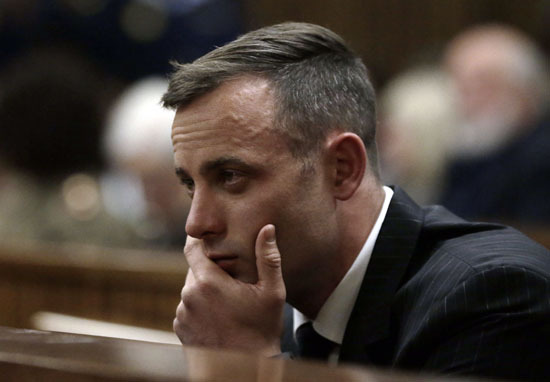 Pistorius admitted to shooting her through his bathroom door but claimed that he mistook her for a possible intruder. He was convicted of ‘culpable homicide’ and sentenced to five years in October 2014. He served only one year and was released in October 2015 to serve the rest of his sentence under house arrest. However, Pistorius’s manslaughter conviction was overturned and he was found guilty of murder, resulting in his sentence being lengthened to 13 years and five months in November 2017. The case has been extremely controversial since day one, so people are understandably very annoyed about the prospect of people wearing this costume. The costume is categorised under the website’s ‘Bad Taste and Shocking Fancy Dress Costumes’ section, and it does include a warning to those who may take offence. WARNING! If you are easily offended, our Bad Taste Costumes may not be for you. Here at Jokers’ Masquerade we decided to be a little rebellious by compiling this collection of wonderfully inappropriate costumes for adults, for those who like to push the boundaries. Our offensive fancy dress costumes are perfect for those with a black sense of humour. So it looks like the outfit is here to stay, despite people’s clear (and in my opinion, justified) objections. I get the whole dark humour thing but when it comes to making light of the horrific murder of an innocent young woman, I think I’ll pass and stick to my mermaid costume, ta very much.